The Fallen Man, reunites newly retired Navajo Tribal Policeman Joe Leaphorn with Acting Lieutenant Jim Chee to finally close a case involving a sniper, a skeleton, and eleven years of unanswered questions. In this evocative mystery, the past and present join forces in a most unholy union. In The First Eagle, Jim Chee catches a Hopi poacher huddled over a butchered Navajo Tribal Police officer. Chee seems to have an open-and-shut case--until Joe Leaphorn blows it wide open. Hunting Badger balances politics, outsiders, and fugitive armed bandits. After the Ute tribe's gambling casino is raided, FBI agents swarm the maze of canyons on the Utah-Arizona border. 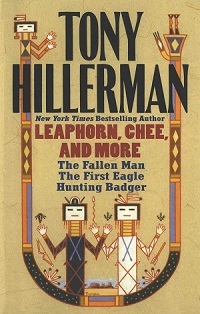 But Chee and Leaphorn find fatal flaws in the federal theory that accuses a wounded deputy sheriff as a suspect, and they are soon caught in the most deadly hunt of their lives.